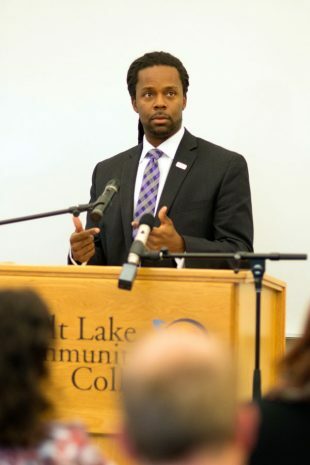 Roderic R. Land, PhD, and other leaders at Salt Lake Community College are promoting unity on campus in the aftermath of a contentious presidential campaign. 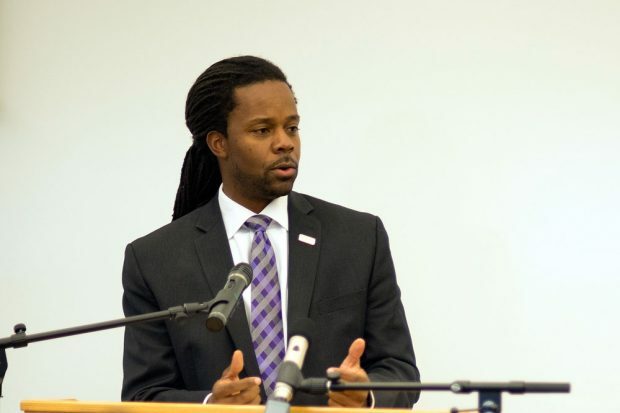 Land, the special assistant to President Deneece Huftalin, sought to reassure fearful students and staff during a discussion titled “Bridging the Political Divide: Hope, Healing, and Reconciliation” last Thursday at Taylorsville Redwood Campus. 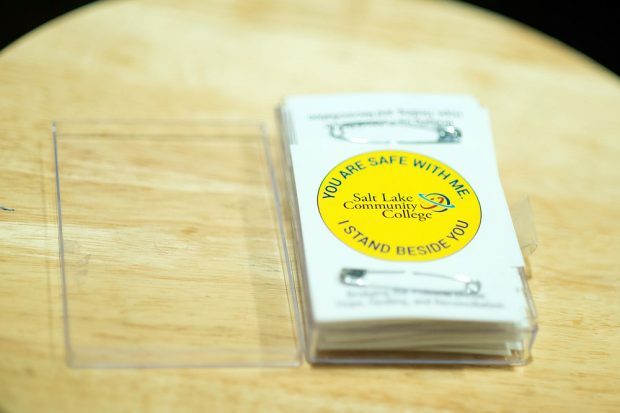 Land said SLCC will always be a safe place, despite the results of the recent election. In reference to the controversial remarks by President-elect Donald Trump, Land also told Trump voters that they too had a place on campus, despite a year and a half of extremely divisive rhetoric both emanating from and directed to them. Scott Kadera, manager of counseling services for the Center for Health and Counseling, also addressed the audience and talked about the #safetypin campaign, which indicates a citizen’s willingness to be an advocate for groups who feel marginalized or threatened. After Kadera finished his remarks, Land further explained the symbolism of the movement. Land then accepted questions and commentary from the audience. The audience was nervous, as evidenced by the amount of joking around that took place before the event, but possessed the wide array of viewpoints. Regardless of how they felt about politics, the SLCC staff members who attended felt the need to let their students know they cared for them. 1. Acknowledge your feelings, figure out how you really feel about the results. 2. Be mindful of keeping up your routine: keep showering, eating, going to school. 3. Access your support network: Connect with friends and family. 4. Consider limiting your intake of news and social media. 5. Clarify your personal values, and figure out what is important to you. Counseling appointments are available for $10 at the Taylorsville Redwood, South City, and Jordan campuses. For students who feel they have no other place to turn, and who need someone to talk to, a crisis line has been set up at 801-587-3000. Other attendees were decidedly more conflicted on how to proceed with the national dialogue in the wake of such a momentous election season. “This is a catalyst for change, hopefully for positive change. For hopefully bringing about those allies and coalitions we need to create positive change,” said Barbie Willett, associate dean for the School of Business. Jan Coleman, a staff member with Institutional Marketing and Communication, expressed her apprehension at the awkwardness that is sure to pervade almost every Thanksgiving dinner this week. “What’s the point in having that conversation if everyone’s going to get upset?” she asked. Land, cool as a cucumber and with a smile, knew exactly how to respond.